In 1925 the Manchester Irish trade unionist Mary Quaile led a TUC delegation to the new Soviet Union. Mary had spent her life working at a grassroots level with women workers; advocating for women’s involvement in trade unions so that they could get equal pay and decent working conditions. In the Soviet Union she saw a different society that had at its core a worker based politics with factory committees that existed to promote wage equality, and state policies that had as much to say about the private lives of workers as about the economy. After the 1917 revolution in Russia many activists in this country saw its society as a positive example of how life could be transformed, both personally and politically for women, men and children. But In 2016 we are all fed up with our stagnant political system, and our politicians who inspire hatred rather than hope. Brexit was just one example of people hitting back at the political elite that run this country and who refuse to either take notice of or include within the political discourse the rest of us. 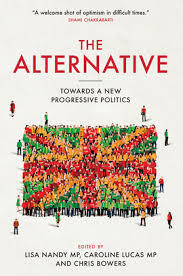 In a new book edited by Lucas, Nandy and Bowers, The Alternative Towards a New Progressive Politics, they cites as a major problem the unfair electoral system and suggest that “progressives” (not quite sure who they are) should work together to oppose the Conservative government and its policies. Unfortunately “progressives” are few and far between amongst the political classes, and it’s hard to see how the ordinary person on the street can really believe this message. Politicians in this country and the political elite that surround them, with a few exceptions including Caroline Lucas and Mhari Black, are now so despised by the public it is highly unlikely they would buy the message from this book. Indeed would they even bother reading it? Who are books like this written for? Is it just written for the same Guardian readership? What about the rest of us? People are looking for hope and look to other societies that may give a real alternative to the stagnancy of western politics and politicians. 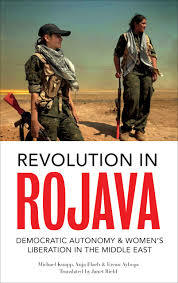 In a new book, Revolution in Rojava: Democratic Autonomy and Women’s Liberation in Syrian Kurdistan, we can see how people in a war zone, and surrounded by enemies, have created a community-based democracy, putting at its heart the equality of women. What makes this book relevant is that the writers are not just observers of Rojava, but have fought to defend this communally organised democracy. Both Anja Flach and Ercan Ayboga have taken part in the revolution, while Michael Knaff is an activist with the Berlin Kurdistan Solidarity Committe. So where is and what is Rojava? It is part of northern Syria, and includes three cantons of Cizire, Kobani and Afrin. It is a war zone, surrounded by ISIS and Turkish forces which are hostile to the Kurdish people. In January 2014 these three cantons issued a declaration of Democratic Autonomy creating a “democratic-autonomous administrations,” which would be inclusive and pluralistic: a “third way” rejecting the Ba’athism dictatorship of Assad and the chauvinist Islamist opposition. Central to this new society is the Kurdish freedom movement and the Kurdistan Workers Party (PKK), a Marxist-Leninist party (including Turkish and Kurdish revolutionaries) that after the fall of the SU in 1991 adopted a new vision of politics and society in the Middle East. The Kurdish people are one of the most repressed in the world and although, and particularly in this country, there is a vibrant campaign to support the Palestinian people, there is little information or news about their struggle. Kurds are a displaced people, hated by the Turkish governments who have over the years persecuted them, and after the military coup in 1980 allowed the PKK to settle in Syria. The aim of the PKK was to establish a homeland in Northern Kurdistan.